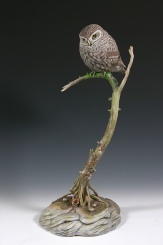 The Association promotes and develops the art of wild bird carving and supports the interests of all those who carve wild birds. Opinions vary from a working lure to a work of art. The quotes below demonstrate the diversity of feeling on the issue. 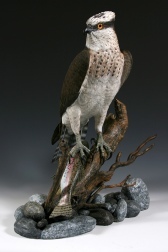 The BDWCA promotes all aspects of bird carving as a demonstration of the variety of this art form. Decoys have been used for centuries by many cultures around the world. They were designed to attract wild animals, usually birds, within the hunter’s range. Examples in America go back 2000 years, but it was in the late 19th Century that they became an issue of conservation concern. Used in small numbers decoys probably have little impact on wildlife populations, but as the urban populations of the eastern seaboard of the USA exploded the demand for cheap food grew rapidly. Hunting over huge rigs (flocks) of decoys had a major impact on the populations of certain duck species, notably Pintail and Ruddy Duck, and in 1918 the US Congress passed the Migratory Bird Act outlawing this type of hunting. This was arguably one of the first pieces of modern bird conservation legislation. Nowadays in this country, and many others around the world, decoys are increasingly used to attract wild birds, enabling capture for weighing, ringing and checking the general health of a species. The demise of this form of hunting left many decoy makers out of a job, and many thousands of decoys must have rotted away or been burned as firewood. A few people turned to the art market and started to produce purely decorative decoys – the type we see at BDWCA events today. Primarily an American art form, the ­decorative decoy came to Britain in the early 1980’s, promoted by the late Bob Ridges. Many members of the BDWCA owe their introduction to carving to Bob, and the Association has grown steadily since 1990. Three styles of carving exist today – Decoy, Decorative and Interpretive. Decoy style reflects the origins of the art. Birds must depict the salient features of the species but may be of quite a simple design. They should be capable of attracting fellow members of their species – some are now used as ­photographic decoys. Decorative style is perhaps the most challenging as carvers seek to recreate lifelike depictions of birds. This is an ­opportunity to demonstrate their skills, and the finished article can be almost indistinguishable from the real bird. Interpretive style allows great freedom to produce an artistic representation of a bird. Here almost anything goes providing the work clearly depicts a bird and is carved from wood.